This program is one of the very few attempts to document the acquisition of an endangered language in a remote area focusing on the natural development of children without restricting the converation partners of the child in any way as is usually the case with most longitudinal studies conducted in advanced industrialized societies. The goal of the Chintang Child Language Program is to provide an audiovisual documentation of how children learn Chintang as their first language. The documentation consists of video recordings of 6 Chintang children over a period of around 2 years. Children were video taped for approximately 4 hours per child and per month in their natural environment to allow for the analysis of their language development. The two youngest children were babies aged 6 months at the beginning of the study, two children were two years old and two children were three years old when we started recordings. Most of the recordings took place outside the house on the veranda or in the nearby garden. 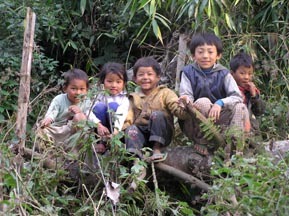 A Nepalese research assistant in collaboration with local assistants who were native speakers and neighbors of children recorded the children to minimize the observer effect as much as possible. Since no influence was imposed on the context of recording there were usually a number of other children and adults present, either interacting with the child or talking to each other, which mirrors the daily life of the children. Situations included mostly free play, roaming around, having a snack, teasing animals or other children. The recordings were then transcribed, translated into Nepali and English, morphologically glossed and tagged for parts-of-speech.